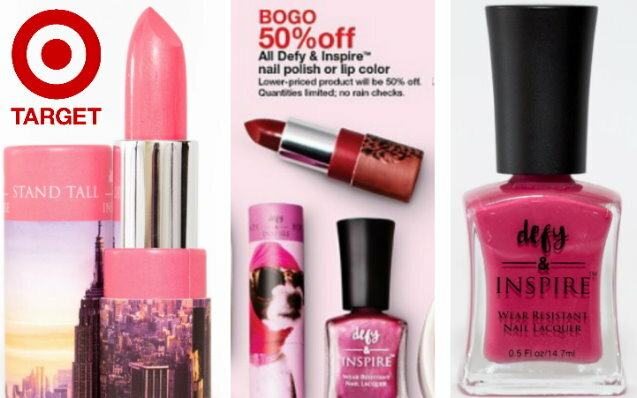 This week thru February 16th, Target.com is offering up a B1G1 50% Off sale on Defy & Inspire Nail polish and lipstick both in stores and online. No code or in-store coupon is needed, just keep in mind the lower-priced item will be the one that is discounted 50% Off. These cosmetics are priced at $7.49, and while I’ve never tried the lipstick, I am a fan of the nail polish and they do have several new shades out – especially in pinks and reds. If you are shopping online you can check out the color choices HERE, just keep in mind you will need to choose free store pick up to get the B1G1 50% off.